Which Heat will Bulls see for Game 2? Welcome back to the Miami starting lineup, Zydrunas Ilgauskas. No, it’s hardly official and no scoop that I know of. Plus, in a Pat Riley organization treason clearly is associated with speaking frankly to the media. They know nothing! But the Miami Heat coming into Game 2 of the Eastern Conference semifinals Wednesday in the United Center trailing 1-0 probably have no chance against the Bulls — anyone write that sentence before? — unless they return to a bigger lineup. And changing Chicago’s rebounding advantage — 45-33 in Game 1 and 31-8 on second chance points — is just part of the equation. Substituting Ilgauskas for Joel Anthony isn’t the strategic clincher for Miami. Obviously, the Heat’s chances hinge on whether LeBron James and Dwyane Wade decide whether they want to play in this series. They apparently didn’t care to in Game 1, although the Bulls defensive effort surely deserves credit for discouraging them from caring enough. It’s obvious the Bulls turned them into passive spectators as no defense is quite that good. They seemed to give up, which James is said to be experienced at in the playoffs. Then their pointing to a lack of production from the bench and a lack of rebounding and second effort seemed pretty weak. Sort of the I-win-you-lose syndrome you sense with this Heat team at times despite all the rhetoric about them all being in it together. Though we see it on many superstar teams. We heard that plenty when Michael Jordan would score 45 and the Bulls would lose. Hey, he got his! This time Wade and James can’t say that, either. You didn’t sense the individuality when Miami won in 2006. But this group seems like James and Wade together, as they appear to be virtual Siamese interview twins never speaking separately, and the rest of the team to fend for itself. I know James said he couldn’t win with the Cavs and he did spend seven years there, hardly a tease. But you don’t see anywhere near the joy and camaraderie between he and his teammates that you did in Cleveland. Though he and Wade seem to have a lot of fun. I always felt one of the big reasons for Boston’s success with their so called Big Three is how much they had previously failed. Why just putting together three so called stars is hardly a formula to excellence despite what it seemed like with the Celtics. Kevin Garnett back then was likened to Tracy McGrady with first round failures. Heck, Ray Allen was traded for an old, cranky Gary Payton. They were at a stage of their careers ready to compromise and accept subsidiary roles. It’s very difficult for Wade and James to do so, even if I believe they really are trying. Meanwhile, perhaps James could have boxed out once or twice. Or Wade might have tried to finish strong on some drives instead of laying the ball up tenderly and missing at least a pair of point blank layups early. I think the Heat fell into a trap of believing their smaller, quicker lineup would be good enough given the success it had against the 76ers and Celtics. But Philadelphia was small with Spencer Hawes and Elton Brand and often going with four guards or small forwards. Boston had been big, but as the series went on there was no Shaq, no Jermaine, Kendrick Perkins long gone and Baby Davis back to being 6-6. So James could play power forward with the more athletic Anthony at center in those series. The Heat clearly misjudged the Bulls and made a big (pun intended) mistake, it seems to me, making Ilgasukas and Erick Dampier inactive. They’d started 79 regular season games combined and Ilgauskas the first eight playoff games. Riley teams always were known for stability. But this one has been as unstable as any. Though it’s not completely by choice. The Heat’s summer coup was adding James and Chris Bosh. But that left little money for anyone else. They were creative and got Mike Miller when he was an NBA player. But he broke down again and you could see in Game 1 he didn’t even want to shoot. I’ve been surprised they don’t play Eddie House, who has been a big time shot maker all his career. He made big shots and helped turn the 2008 Finals along with James Posey in Game 4 when the Lakers took a 21-point first quarter lead. Their stretch probably won the championship. 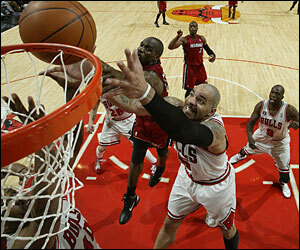 House also made huge ones against the Bulls in that great 2009 playoff series Game 7. He’s to put it delicately, a bold player, as he too vividly demonstrated earlier this season when he made a winner against the Thunder and was fined by the league for a much too creative physical expression. But there seems to be that trust issue. Watching the Heat, it seems James and Wade only trust James Jones. But the Bulls scouted Jones well. He almost never puts the ball on the floor. He had among the league’s highest number of assisted shots, meaning he never much dribbled. The Bulls closed beautifully and he doesn’t even like to take one dribble and shoot. So he didn’t. The Heat at the start of the season lost their Taj Gibson, Udonis Haslem. That was a major loss. Haslem is back and played briefly in Game 1, but he sits even during games with a pack on his shoulder. It’s uncertain how much he could help. So Miami’s roster is much more limited. Actually, the thinking coming into the season (outside South Florida and ESPN headquarters) was they’d get close, perhaps lose to Boston, add players and then begin their run next season. But after that 9-8 start, they began to improve and the Celtics languished after trading Perkins and not getting back O’Neal. I don’t believe the Miami celebration after beating the Celtics signified their ultimate achievement. But I do think they took the Bulls somewhat for granted. Hey, Bosh is not going to shoot one for 18 again. We’re not going to get beat on every last possession. We’re not getting the call to go against us at home like it did in losing the third regular season game to the Bulls. Both James and Wade averaged almost 30 against the Bulls. Hey, Bosh gets 15 and we’re in. Look, maybe this has awakened them. But Miami probably needs to win Game 2 because they seem more front runners who can pile on but don’t exactly react to being behind that well. The Bulls’ rebounding margin has been the story of the two off days after Game 1. Miami isn’t going to win playing small, which was clear in Game 1. We hear all the time how he is the size of Karl Malone. OK, so why doesn’t he play a little like Malone? James is almost never in the post. And when he is you can see he prefers to wait for the double team and pass out. I saw the 76ers put Evan Turner on him and he still didn’t care to take him in the post despite having such an advantage. With James in the post and Wade on the weak side that would be very difficult to contain. But James seems to only like his personal comfort zones. He doesn’t seem to like to make strong moves in the post, for whatever reason. We used to call Garnett names, like soft, for that. You cannot say that about a king. I’d expect Miami to go with Ilgauskas at center and invert its offense, maybe putting James inside at times and then having Ilgauskas, who can make an outside shot. Ilgauskas also is 7-3. And while he’s not particularly mobile, he can get offensive rebounds and present some size at the rim. What Miami is doing reminds me of the 2007 playoffs when Dallas came in with 67 wins and decided to go small against Golden State and ended up losing in the first round. They’d played all season with Erick Dampier and DeSagana Diop at center, and then abandoned that and basically went with Dirk Nowitzki their tallest player. Former Bulls player and Charlotte coach Sam Vincent was an assistant for that Dallas team. He said the Warriors were so fast up and down the court they didn’t feel as comfortable with their bigs. Perhaps Miami did as well. But when you make so many changes it can affect who you are and how you play. Though I still could see them going back to Mario Chalmers at point guard. Although Mike Bibby did OK in Game 1, at least for a guy who can’t guard a water bottle, he obviously lessens their ability to trap Derrick Rose. Chalmers knows Rose from many previous games all the way back to their NCAA finals game. I think that’s also a big reason Luol Deng did such a good job on James and usually plays him pretty well. Although Game 2 will be a challenge as James, effectively, has been called out nationally and back in Miami for his passive play in Game 1. When James was the No. 1 high school player in the country in 2003, Deng was regarded as No. 2, a quiet kid from Sudan at Blair Academy in New Jersey whose games weren’t on ESPN, like James’. Deng was committed to Duke, but knew James and his game and always believed he measured up. 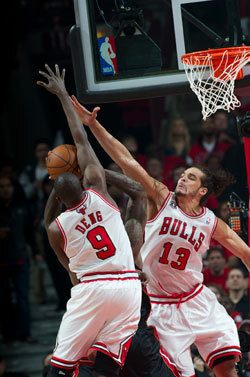 As a result, Deng never has been intimidated by James and always has challenged James physically. James, of course, is more skilled, but Deng never gave James’ ego or reputation room for comfort when Deng played him. You could see that again in Game 1. The Bulls, as much talked about after Game 1, were impressive with their relentless approach, their interior defenders quick enough to switch on Miami’s ball handlers to lure them into being jump shooters. The Heat much discussed moving the ball since, which is hardly some revelation. It has been in every one of their game plans all season. It’s been a surprise not to see them find James with a dribble at the elbow where he can make a play. The Bulls did a good job finding the short corner three, shooting 10 of 21 on threes, and keeping Miami out of that sweet spot. When the Heat, which isn’t a particularly physical team, did trap, the Bulls got the ball forward to Noah who can make plays from the free throw line area. That bothered Miami. The Heat did bring in Jamaal Magloire, who laid a hard foul on Rose. But Magloire was so pathetic he couldn’t jump and hit the bottom of the rim trying to dunk, though he put the ball back in. The Bulls played Miami soft in the middle and welcoming those jump shots. Miami had so many lineups with non scorers, and I count Bibby among them, it never hurt the Bulls when they played Keith Bogans. It was Miami often playing three on five given Anthony played 31 minutes and was scoreless. The Bulls played so far off they were sending him post cards from where they were staying. The ethic of Pat Riley teams, and I don’t diminish Spoelstra as he is a bright coach, is less adjustments than playing harder, that more effort can conquer all. Of course, Riley made famous “rebounds equal rings.” We know what few assists and too many jump shots equals. But clearly James and Wade have to contribute to that rebounding. Actually, the Bulls had difficulty in the Atlanta series when athletic Josh Smith rebounded and dribbled out of the backcourt and attacked. It was surprising not to see James and Wade do that more often, and I’d expect to see a lot more of that the rest of the series. Miami’s second half was an astonishing study in ineptitude and indifference, one overwhelmed by the Bulls own assiduous play. 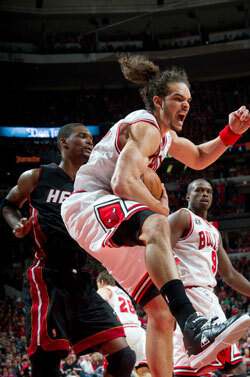 The Bulls committed one turnover in the second half, which is pivotal against the Heat. Limit turnovers to keep them out of transition and keep them off the free throw line. It’s the formula to defeat them. The Bulls in that second half had a 17-0 margin in second chance points and 9-0 in offensive rebounds. The Bulls made seven of 14 threes while Miami had five assists, 11 for the game. Wade didn’t attempt a shot in the fourth quarter being guarded mostly by Rose. And James shot just three as they were combined 12-32 overall, that number now maybe their newest tattoo. It was a particularly passive effort from the Heat. The Bulls hardly expect to see that again. They’ll likely see a better Heat team and likely a different one, at least in lineup and rotation. The larger question will be how the Heat respond to that punch in the nose. I wrote about boxing many years ago and remember boxers talking about when their opponent lands a big time punch and knowing, perhaps for the first time, they can be knocked out. After that happens, you can to go into the ring with a bit more caution knowing he has the capability to put you away. The Heat took a tough shot. Will they come out fighting or retreating?